I’m stoked to feature my guest for several reasons. First and foremost (and the impetus to this interview) is her new book, Steel and Song. This book really knocked my socks off (which, as many of you know, is quite a feat as I love my socks). 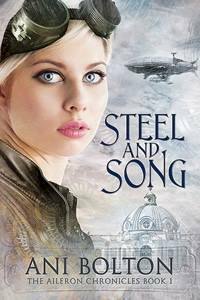 Trust me, even if you read no further, and you love a well-crafted steampunk alt-historical world populated with relatable characters in briskly-paced story, head over and download Steel and Song, by Ani Bolton. In fact, go do that now, then come back and read on. I’m also excited because Ani is actually the writerly alter-ego of Kathleen Bolton, who is one of the co-founders of Writer Unboxed, which is the home-base of my writing community. Kath has been my boss, both as the project manager of WU’s former review site, Reader Unboxed, and as the original editor-in-chief of the WU newsletter, Writer Inboxed (now on hiatus). She’s also been a wonderful mentor, an inspiration, and a friend for some years. And now, with Steel and Song, she’s schooling me again. As you’ll see in the interview, our work shares some similarities, and her technique and style have been a shining example for taking a story to the next level. So, without further ado, please enjoy a bit of inspiration from my old friend/new role model. Vaughn Roycroft: I want to ask you about your use of historical elements, because I rely heavily on actual history as well. S&S is filled with magical and fantastic elements, but it feels heavily grounded (in my opinion) because of the real history you’ve woven in. Did you set out with the intent of creating an “alternate history” piece? Do you think utilizing real history is an advantage to you as a writer or an enhancement to the work in general? 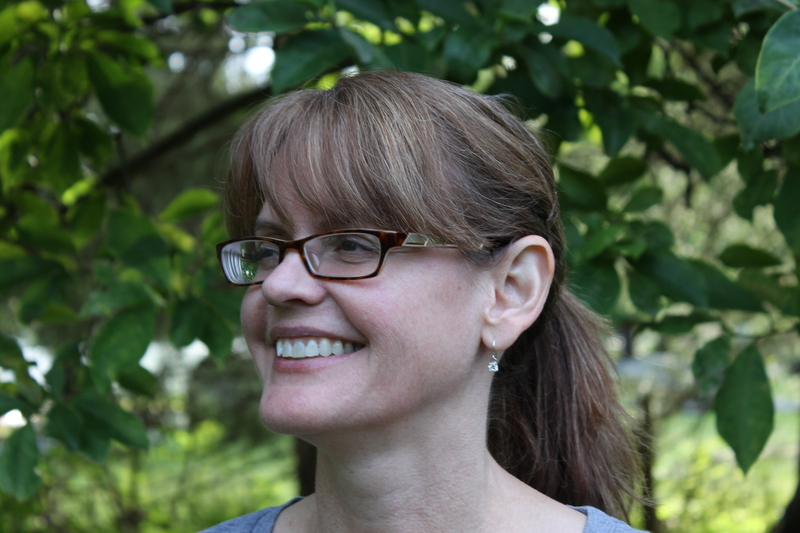 Ani Bolton: I came from writing historical fiction as my first love (I actually have a useless graduate degree in early modern European history, shhhh), therefore, weaving in actual historical events but giving them that alt-world feel comes naturally. I’m a history junkie and I’m inspired by real-life events. I do think using real history as a world-building technique adds verisimilitude and a sense of “this could actually have happened”, which allows the reader to immerse themselves more fully into the alt-universe created. VR: I recall an essay you did for Writer Unboxed a few years ago in which you recommended Barbara Tuchman’s Guns of August. Were you always drawn to WWI, or to the Russian scenario during the era? If yes, why so? AB: I’m kind of a war junkie in general. 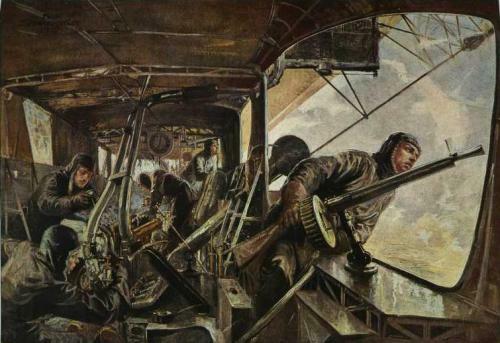 But I find WWI an interesting historical moment, where the 19th century and the 20th century clash. Aristocratic privilege was under siege by revolutionaries; mechanized war was replacing cavalry charges, and the lines between classes were blurring. Plus, the stakes could not be higher. It’s an era full of interesting contradictions, which of course makes it ideal for storytelling. When I began drafting what would now become Steel & Song, I had a close loved one deployed for Operation Iraqi Freedom. The US propaganda machine was in full swing, and as a historian I could see the eerie parallels to the jingoism and nationalism that took place in earlier wars. Peace through War. Freedom through Oppression. We’re destroying your country to save it. The ones making the greatest sacrifices in a time of war are, as always, on the bottom of the ladder. So I wanted to tell a story with characters who slowly discover that their society is both cancerous and opulent, and give them terrible choices to make. The Russian Empire in the era of the last Czar Nicholas mapped perfectly. Plus, it’s just cool. I do find it interesting that I was writing Steel & Song around the same times as Suzanne Collins was probably drafting out Hunger Games; dystopian fiction in general was taking off. I think we were all drinking from the same well. VR: There are so many layers of conflict in the story (beyond the Grand Duchy versus the Franks, there is the Novgorod versus gytrash, and even other ethnic gytrash versus Sámi). I found it really interesting that those born with magic were relegated to an inferior social status. The book makes a solid statement about social conflict and the fear behind racism and class stratification. Were these themes on your radar at the onset, or did they develop during the process? AB: I definitely took cues from the racial oppression in Europe during the fin de siècle where there were fears of Jews, gypsies, and generally anything that was considered “other” and how intellectuals rationalized bigotry with bogus scientific theories. For Steel & Song, I thought it would be interesting to tell the story of a character whose being could either be the country’s agent of destruction or its salvation—which way is it going to go? I haven’t really decided. As a storyteller, you want to go for the throat and be sure that your character’s greatest strength is also their greatest weakness. VR: You chose to present Tova via a first-person perspective and Dashkov via third-person. Although I really enjoyed this nuanced approach, I wonder if you’d be willing to share some insight as to how this developed on the page. Do you prefer one POV over the other as a writer? As a reader? I prefer to write in first person POV but honestly, the two different POV techniques were how the characters spoke to me. Tova came to me fully formed: her voice was complete and it was in first person. Dashkov took a little longer. I also thought using close third for Dashkov would allow me to use close third for other characters without it coming from left field—for example, I cut Oleg’s POV scenes on the advice of several betas (koff,Therese and Jeanne,koff). They weren’t as enchanted with his brutishness as I was, LOL. AB: Thank you! Backstory is a tricky beast, especially when writing an alt-world novel because you need enough to ground the reader and hook them without resorting to an info dump. I am a plotter, but backstory is where I pants it. I think letting the backstory emerge naturally rather than hewing a plot to a backstory allows for surprises. And sometimes it’s helpful to just drop the hint that there’s something about a character’s past that readers should pay attention to, and come back to it later. VR: I’m slightly ashamed to admit that this is my very first Steampunk novel. For me, the concept of an airwitch is totally unique, and so creative. And I love that their magic is limited and can even turn harmful if overused. Could you share your perspectives on magic with us? AB: A long time ago, I read something from the paranormal novelist Holly Lisle who said that “magic must come with a price”. That stuck with me. It’s also the overarching theme of most of my books: what is taken must also be given. What could be higher stakes than magic that can kill the wielder? Plus, it’s sort of boring if every problem can be solved with magic. A problem solved by magic must lead to a bigger problem. Steampunk and dieselpunk (cyberpunk and biopunk also) are thriving subgenres of science fiction right now. I love the mashup aspect of it, where novelists can draw from all sorts of inspirations and mush them up. Fantasy with a sci-fi twist. That’s kind of my thing anyway. AB: LOL, I can’t say much about Writer Unboxed Publishing right now, but what I can tell you that Therese and I are in serious discussions about it. Launching Steel & Song through the WU imprint with the support of the WU community has been hugely helpful, and we are gleaning valuable metrics about marketing and co-branding, which is the strength of WU brand. We want the venture to benefit both the author and the publisher. We’ll have more to share about it soon, promise! Ani Bolton’s love of storytelling started when she was a kid, ignited by Laura Ingalls and Nellie Olsen’s epic smackdown, which stole her sleep on a school night. She’s been scribbling stories ever since. Her novels blend her love of history and adventure with romance, magic and the occasional foray into the weird.Her alter ego is Kathleen Bolton, co-founder of Writer Unboxed, a writing community. She’s written a number of novels under a variety of pen names. Find out more about Ani at the following hangouts: Twitter: @Ani.Bolton; her website; Tumblr if you’re into WWI, gifs of cats being magical, and ‘punk (steam and diesel—she’s equal opportunity); and Facebook, which is like her Tumblr page but with more pictures. Actually, her Facebook page is kind of a mess. Thank you again for featuring me, Vaughn! Defining “Hero”: So I was sitting here wondering how to title this post. I jotted the words: “Chatting With A Hero.” Then I wondered if I was overselling (I’m sure she’d humbly say as much). But a hero is someone admired for their courage or outstanding achievements. And, I would add, someone who inspires courage or the aspiration of others to strive for the outstanding. I was surprised when I googled “hero” to find the words “typically a man” in their definition. I consider quite a few women to be heroes, my wife first and foremost. So then I wondered if I should switch it to “heroine.” But that word seemed to relegate the subject to the pages of a story or the script of a movie. And Therese Walsh is definitely a real-life, flesh-and-blood person that I admire; for her courage, for her example in persevering to accomplish the outstanding, and for her inspiration. She fits the billing. So hero it is. An “Interesting” Experiment: What (I hope) you are about to witness is an experiment. I’ve never really interviewed anyone, let alone in a video format. But when Therese and I stumbled across the idea, I thought that it would be a lot of fun, at the very least. And it was. But in hindsight, it also gave me a huge appreciation for those who interview writers they admire, and for those who do so on camera all the more. I hope you’ll forgive my inexperience but, as I said, at least it was a lot of fun. And although I’m not the most experienced moderator of such a discussion (we occasionally got a little carried away, enjoying our shared passion for writing), thankfully my subject is interesting and wise and her new book is wonderful. These things, I think, come clear throughout our occasionally rambling discussion. Besides, as I said, T inspires me. And I’m willing to bet she’ll inspire you, too. 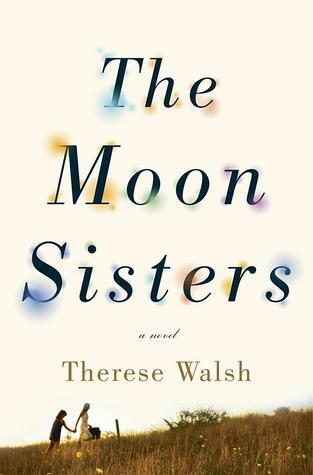 So, without further ado, please enjoy my discussion of a new favorite book of mine, The Moon Sisters, with its author–my hero and friend, Therese Walsh. After their mother’s probable suicide, sisters Olivia and Jazz are figuring out how to move on with their lives. Jazz, logical and forward-thinking, decides to get a new job, but spirited, strong-willed Olivia, who can see sounds, taste words, and smell sights, is determined to travel to the remote setting of their mother’s unfinished novel to say her final goodbyes and lay their mother’s spirit to rest. Already resentful of Olivia’s foolish quest and her family’s insistence upon her involvement, Jazz is further aggravated when they run into trouble along the way and Olivia latches on to a worldly train-hopper who warns he shouldn’t be trusted. As Jazz and Olivia make their way toward their destination, each hiding something from the other, their journey toward acceptance of their mother’s death becomes as important as their journey to understand each other and themselves. Therese’s second novel, The Moon Sisters, was published in hard cover on March 4th, 2014 by Crown (Random House). Her debut, The Last Will of Moira Leahy, was named one of January Magazine’s Best Books of 2009, was nominated for a RITA award for Best First Book, and was a TARGET Breakout Book. Therese is the co-founder of Writer Unboxed, a site that’s visited daily by thousands of writers interested in the craft and business of fiction. Before turning to fiction, she was a researcher and writer for Prevention magazine, and then a freelance writer. She’s had hundreds of articles on nutrition and fitness published in consumer magazines and online. She has a master’s degree in psychology. Aside from writing, her favorite things include music, art, crab legs, Whose Line is it Anyway?, dark chocolate, photography, unique movies and novels, people watching, strong Irish tea, and spending time with her husband, two kids and their Jack Russell. Your turn! What are the unique aspects of your writing process? Have you read either of Therese’s books? If not, what are you waiting for? Could there be a more gracious interview subject, or a more bumbling interviewer? Please share your thoughts in the comments.